Billionaire tech entrepreneurs are building hospitals, curing malaria and taking humans into space. Their good works are inspiring younger innovators to dream of building their own unicorn business, so they too can follow in their philanthropic footsteps. But at the same time, a new generation of entrepreneurs are realizing that they don’t have to amass wealth to change the world. They can bake social good into the very fabric of their businesses.For this cohort of innovators, which includes World Economic Forum Global Shapers Adam Long of Conscious Step socks, Oana Toiu of Social Innovation Solutions and Future Makers, and Joshua Ross of Humanitix, social enterprise is their first step. These entrepreneurs start by asking questions that seem absurd, at first. Can socks save the world? Can a ticketing platform change the approach to philanthropic capital? Can young entrepreneurs build the future they want? Their creative answers are generating impacts just as strong as those of foundations. Adam Long, a World Economic Forum Global Shaper from Sydney, was a strategy consultant and board member of an Australian charity when he first asked if socks could change the world. “So much of the organization’s effort was spent on convincing donors and foundations to part with money, yet those same donors were opposed to the idea of the organization developing a for-profit arm to make it financially self-sufficient”, says Adam. "The zeitgeist towards charities was that they should focus on delivering impact, not being entrepreneurial. After I saw Dan Pallota’s 2013 TED talk The Way We Think About Charities is Dead Wrong [below], I realized that entrepreneurial effort needed to happen outside the organization. "As an independent social enterprise, Conscious Step can take risks, incentivize staff with bonuses, even give away socks - and the money will flow to the charities without donors batting an eyelid." To date, Conscious Step has funded 110,000 trees through Trees For The Future, 216,000 months of clean water through water.org and 25,230 meals through Action Against Hunger. Last month, Conscious Step gave $100,000 to the charities it supports. “Had I stayed in consulting, it would have been decades of climbing the corporate ladder before I could afford a personal donation of that size”, Adam says. With Conscious Step running smoothly, Adam now invests his time in increasing access to justice. His latest venture, Smarter Drafter, is an AI-powered virtual lawyer that makes legal services affordable. Oana Toiu has had a remarkable career, including a stint in consulting and an appointment as State Secretary of the Government of Romania. With many doors open to her, Oana sought to mobilize an entire generation of problem solvers through social enterprise. Oana is clear in her diagnosis: "Collectively, we have the resources and the technology to feed everyone on the planet, to educate every child, to foster every refugee family, to respect and protect our elderly, and without destroying the planet in the meantime. What we are missing is the power to lean that way, money- and status-wise." Oana’s work focuses on two solutions - funding great ideas, and raising the status of those putting great ideas into practice. 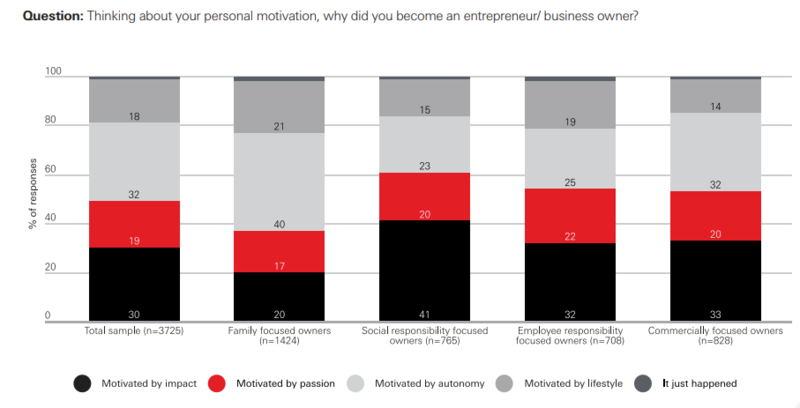 What traits do entrepreneurs need to succeed? Joshua Ross co-founded Humanitix, the first not-to-profit ticketing platform that redistributes the profits from booking fees to fund global education initiatives. Joshua was doing exceptionally well in one of Sydney’s leading hedge funds when he changed his career from finance to social enterprise. "One limitation of traditional philanthropy is that highly industrious people, who are generally our most talented problem solvers, spend 30-40 of their most creative, productive, innovative and driven years on projects which don’t inherently improve the world. Thank god for these philanthropists, who, after having done well in their career, plug a major piece of the puzzle in solving social problems." "Human capital is humanity's greatest asset and we need a balance whereby more industrious and talented people spend their core career solving problems that matter. I was on the path to becoming a traditional philanthropist, but when I and my co-founder had the idea for Humanitix, I realized it could do more good for this world than my alternative, which was a career in the hedge fund world. So while it’s been hard to leave a comfy, well-paid career, I feel more alive and content today than ever before." Interestingly, Josh’s finance background led to one of Humanitix’s greatest innovations, which in turn has changed how tech giant Atlassian approaches philanthropic capital. “I realized that foundations invest their capital in traditional businesses, such as banking and insurance, in order to generate a return, which is then funnelled to charitable causes. We went to Atlassian's foundation and asked: 'why not invest your foundation's capital in us instead? Rather than receiving capital back to your foundation to then be granted to charities of your choice, why not have a fixed percentage of Humanitix’s profits flow directly to the exact same charities?'" "With this idea, Atlassian funded Humanitix with a $1.2 million impact investment, and now ‘own’ the rights to a percentage of Humanitix’s social impact, which is forecast to generate a massive multiplier on Atlassian's investment. It’s an idea that could fund the next generation of not-for-profit social businesses." Make a billion dollars or help a billion people? The Bill & Melinda Gates Foundation's efforts are truly impressive, and possible because of the incredible success Gates had with Microsoft, combined with his generosity after retirement. Zuckerberg San Francisco General Hospital is an incredible safety net hospital. The foundations established by Henry Ford, John D. Rockefeller and Howard Hughes all continue to drive incredible change. But as Josh, Oana and Adam all demonstrate, the next generation of people changing the world are skipping the billionaire phase altogether, heading straight out in a career to help a billion people instead.